Ahh, the problems with living in a dry climate… All my life I have been lucky to have lived in places with plenty of water. Michigan with the great lakes, and Germany with it’s seemingly year-round rain. I know that many places are not so lucky. Yesterday we ran out of water. Or better said, the city cut off our area from water. Apparently it is very common, and they rotate so that different parts of the city have water on different days. We still have some left in our cistern, but we have to be very careful not to waste it so that we still have enough to do the dishes and flush the toilets. The water department is saying will won’t have water again until Friday. In the meantime, we are washing our clothes and taking showers at an aunt’s house who lives in another part of the city. It certainly makes me appreciate how important and precious water is! 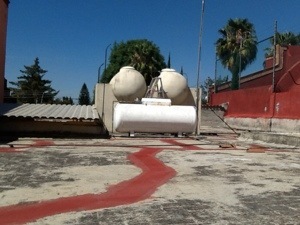 Our Cistern (on the roof). When I was growing up we pumped our own water. When the well went dry, it was a real crisis! Or when the pump broke …. Access to clean, on-demand water is a modern convenience. It takes a real effort to make it happen – reliable water sources, treatment plants, pumping stations, water mains, and a way to pay for it. For the Romans, the water source was elevated aquifers or springs, so gravity did the pumping down the aqueducts. Common people then fetched their water from the public fountains; richer folk could pay for a spur line to operate a private fountain. Along with a water supply, you must also have a sewer system – otherwise the used water flows out onto the streets! So it is really twice as expensive. I remember when our septic field failed; Larry and I spent a month or so digging a new septic field. Very hard and dirty work. I really appreciate good public utilities!